Alcohol (its scientific name is ethyl alcohol) is produced by a natural process when yeasts ferment sugars. Sugars are found in many plants and, since the earliest time, man has used this process to produce alcoholic drinks from fruits and vegetables. What happens to people when they drink? 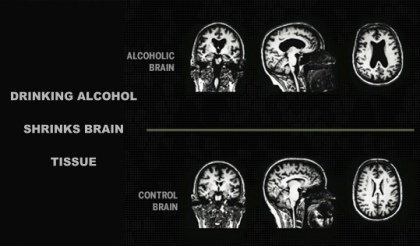 The consequences of alcohol range from a harmless headache to complete deterioration of the liver. 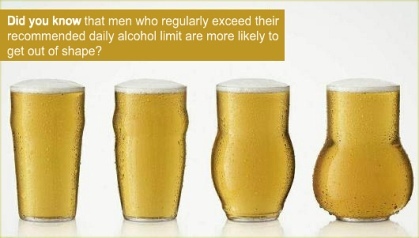 How much alcohol you consume and for how long determine the effect it will have on your body. These days, alcohol is commonly used to relax and unwind with friends after a long day's work. You can see it at cocktail parties, bars and even front patios. People often look to alcohol as an escape from their problems, but they forget the severe physical and psychological effects it can impose. These effects can happen as soon as an hour after digestion or could be more long-term. They can cause physical or mental changes that could threaten the life of alcohol users and others involved. From the moment of consumption, alcohol is immediately absorbed in the blood and then delivered throughout the body. One alcoholic beverage remains in the body for approximately two hours after being drunk. This amount of time can be longer for some than others. The person's weight, gender and other factors determine this. What attracts people the most to alcohol is the happy and calm feeling they first experience as the alcohol concentration begins to peak in the blood. This is followed by a sleepy or confused sensation. You lose a small amount of alcohol when you breathe and urinate, but the rest is absorbed in the small intestines and stomach. 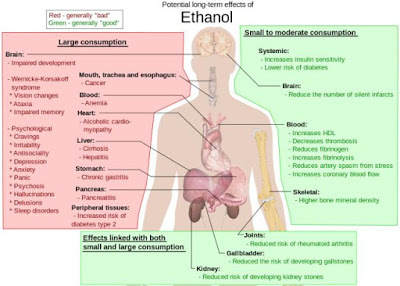 Consuming fatty foods hinders the concentration of alcohol. Drinking more alcohol than your body can absorb results in being drunk. Many people have suffered from serious illness simply because they could not handle their liquor. If this happened to you, alcohol rehab would be necessary. 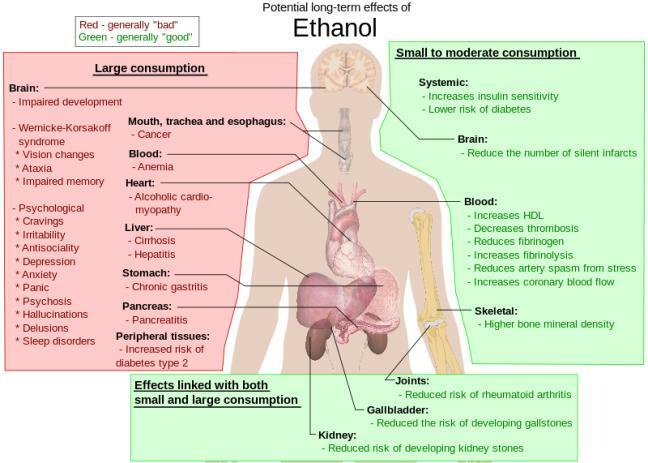 Excessive alcohol consumption affects more than one part of the body. It can be notably destructive to the liver, the organ responsible for alcohol metabolism. People who drink constantly for prolonged periods of time can acquire illnesses including liver scarring or inflammation. More severe alcohol-related diseases can lead to death. 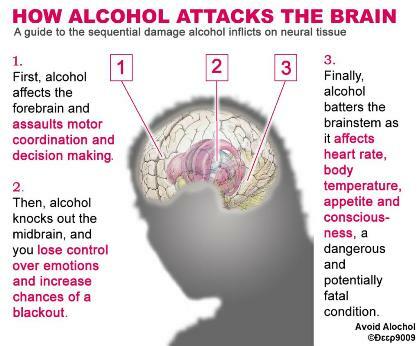 Alcohol also has a significant impact on movement, memory, judgment and speech. It is easy to identify the signs of intoxication as they include memory lapses, impulsive actions, slurred speech and difficulty moving. When people get really drunk, they often end up spending the night vomiting, followed by a painful hangover the next morning. It really is a horrible feeling. Alcohol can also cause noticeable damage to memory after only a couple of drinks. The amount of alcohol you drink increases the level of impairment. Large concentrations of alcohol, when quickly digested, can result in a blackout in which the intoxicated person experiences brief periods of blindness. They also may have difficulty remembering specific details of that night come the morning after. 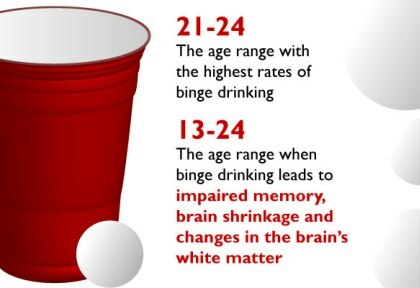 Getting drunk might feel good for the moment, but the long-term effects are not worth it. Not only do you feel horrible in the morning, but you also risk liver damage and addiction. Since alcohol impairs vision and judgment, it is crucial to never get behind the wheel after drinking. If you feel as if you can't stop, there are many rehab facilities dedicated to getting you back on the right track. 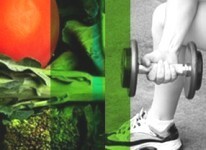 A healthy life is attainable by simply putting down the bottle.